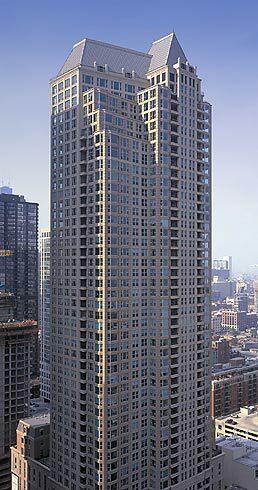 The Fordham Residences are nestled on a tree lined street in the heart of the Cathedral District, across from the Holy Name Cathedral and steps from the famed Magnificent Mile. Standing gracefully at 50 stories, the tower is comprised of one, two and three bedroom condominium homes, 11th floor individual "sky homes" and penthouses. The Fordham amenities are wide ranging, from a wine cellar and tasting room, humidor room and cigar lounge, screening room, all-season indoor pool, fitness center with spa, maid and room service to a dog run and pet recreation area. All residences at the Fordham consist of Gas fireplaces, high ceilings, large windows, private balconies or terraces, and expansive city views. Solomon Cordwell Buenz & Associates Inc. (SCB) is an architectural, planning and interior design firm providing comprehensive services from conceptual design to occupancy and beyond. Established in 1931, SCB has evolved into a firm with over 100 professional employees.